In 2006 two struggles were going on in two different Catholic churches and in two different countries. At Saint Claire’s Parish, Tiplas Kazo, Delmas 33 (one part of Delmas County), Haitian parishioners, students, and community leaders stood up against the decision of the Archdiocese of Port-Au-Port to remove the late activist priest, Gerard Jean-Juste, who had been serving this parish for ten years. Simultaneously at Saint Augustine Church, in Tremé, New Orleans, a similar struggle was taking place. Students of different beliefs and backgrounds, civil right’s movement leaders and community leaders stood up against the unjustified decision of the New Orleans Archdiocese, to remove the elderly African-American priest, Father Jerome Ledoux, from the oldest African-American Catholic church in the United States. To explain the meaning of the people’s struggle at Saint Augustine Church, it is important to understand the history of this church and why it is so important for the African-American Catholic community to keep this church from closing after Hurricane Katrina. In 1842, Saint Augustine church was dedicated under Archbishop Antoine Blanc in Faubourg Tremé, 1210 Gov. Nicholls Street, a poor black neighborhood in New Orleans. It is the oldest African-American Catholic church in the United States. 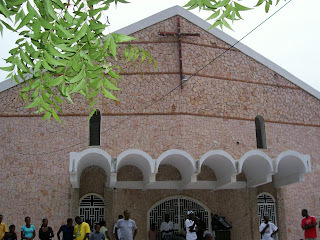 The church’s name is a reference to an African Bishop, Saint Augustine of Hippo. Across the street from the church, on St. Claude Ave, is the Backstreet Cultural Museum, and about one mile away is the historic Congo Square. From Saint Augustine Parish, a person can walk to the French Quarter and Saint Louis Cathedral, whose same architect designed St. Augustine Parish. So within a three-mile radius is profound culture and history. Tremé is the oldest place in the nation where les gens de couleur libres (free people of color) could buy or own properties before the Civil War. Saint Augustine Parish was also the oldest African-American Catholic church in the United States where slaves and freed slaves could practice their Catholic faith traditions. It was also where Henriette Delille, a free woman of color, and Juliette Gaudin, a Cuban, began assisting slaves, orphan girls, the uneducated, the sick, and the elderly among people of color around 1823. Delille and Gaudin’s concern for the education and care of children aided greatly in the founding and administration of the city’s early private schools for people of color. Saint Augustine Church means a lot for African-American Catholics and is essentially one of the leading marks in African-American Religious History; it is a heritage that people inherited from their ancestors. Upon my first visit to Saint Augustine, people explained that slaves’ bones were found in the place where the church stands. According to some historical sources, the place where Saint Augustine stands was a former plantation. On the east side of the church on Gov. Nicholls there is a little place where nooses hang and a few little crosses with a big cross are planted in memory of the former slaves who died and were not given a proper burial ceremony. The former pastor of the church until 2006, Father Jerome Ledoux, was the architect of this memorial place. I have been visiting many Catholic churches across the United States, but I had never seen such a powerful and living parish as Saint Augustine. At Saint Augustine, Sunday is a gospel music feast. Parishoners bring various musical instruments to mass such as tambourine and shekere, a typical African percussion musical instrument that is played by striking it with one or two hands. While singing, people dance and clap their hands. You can see how proud people are of their parish. Although they are economically devastated, parishioners go before the altar to give the little they have to keep Saint Augustine alive. At Saint Augustine, visitors can expect to receive warm welcomes. Whether or not you are member of Saint Augustine, if you celebrate your birthday on that Sunday you are visiting the church, you have a special birthday song where all the people extend their hands to you; this is their way of asking God to abundantly bless you. Saint Augustine Church is a living memorial of the long and hard journey taken by former African slaves to America, and their struggle for freedom after they arrived in America. With the devastation brought by Hurricane Katrina in 2005, the parish began to face some economic difficulties, but thanks to the support of its parishioners, Saint Augustine recovered. The church had to meet the Archdiocese’s requirements: its monthly contribution to the Archdiocese and increasing the number of its parishioners, and if not, the Archbishop reserved the right to close its doors. Father Ledoux was always there with his parishioners. He encouraged them to keep faith and to stay unified as God’s children. Unfortunately, in March 15, 2006, Archbishop Alfred S. Hughes sent Father Ledoux a letter in which he announced that his mission at Saint Augustine’s Parish was over, and he sent Father Jacques, a white pastor of the neighboring St. Peter Claver Catholic Church, as Father Ledoux’s successor. People resisted peacefully, yet firmly. Parishioners and students occupied the church for weeks and vowed to go to jail for the return of Father Ledoux. Leaders of the Tréme community and other civil rights movement leaders such as Jesse Jackson, Al Sharpton and former Black Panther leaders stood up to say “no,” to Archbishop Hughes’ unjustified decision to remove the elderly African-American priest, who had been serving the parish for fifteen years. After a Sunday mass I read on the back of a woman’s t-shirt, “God is good. God is good all the time.” I asked my friend Alison McCrary, a five-year Saint Augustine’s parishioner what her thoughts were on this sentence. She said to me, “God is really good all the time because Saint Augustine could have closed if he wasn’t there with us.” Suddenly, I remembered watching a movie that Allison had given me. This movie retraces the struggle of Saint Augustine’s parishioners for the return of their priest, Father Ledoux, to the parish in 2006 after Hurricane Katrina. This t-shirt was made in 2006 during the struggle for the return of Father Ledoux to Saint Augustine. The struggle was highlighted in the article “Protesters Still Occupying Historic New Orleans Church Rectory” in the March 29, 2006 issue of A Katrina Reader. CC Campbell-Rock interviewed a dozen people. “The protesters want LeDoux back. He should be allowed to stay until his death or until he decides to retire,” said Harris a member of Saint Augustine’s Parish,“Today is just another day in the civil rights struggle.” John Powell, a parishioner at Saint Augustine for the past 59 years, said, "My only statement is that if Hughes spends over $1 billion a year, he could surely give some of that money to St. Augustine Catholic Church.” However, Father Ledoux came back on Easter Sunday and celebrated mass with Archbishop Hughes, and afterward he left Saint Augustine, his home for fifteen years. This return was to fool people, and for Bishop Hughes to pretend that the problem between him and Father Ledoux was solved. In 2007 the Archdiocese of New Orleans assigned Father Quinton Moody, from Belize, as the priest at Saint Augustine Church. The church is still facing economic problems and is still under the Archdiocese’s threat. People are still frustrated, and are unhappy with the way that Father Quinton is leading their church. Since Father Quinton arrived, some memories and traditions of Saint Augustine are slowly disappearing: the chain in the memorial place has been taken down, a pink tub that Father Ledoux used to use to baptize people has already been removed, and the relationship between the church and the community does not seem the same as it was when Father Ledoux was ministering Saint Augustine’s Parish. For example, Father Ledoux used to open the doors of the church to community musicians and bless the Mardi Gras Indians. Some activities such as concerts that used to bring local musicians and church musicians together have discontinued. All of these traditions are now disappearing because Father Quinton does not seem willing to continue them. I remember, the first time I went to Saint Augustine, I saw a few posters of Father Ledoux working with the people in Tremé community excavating for archeological remains of Native Americans, African slaves and free people of color. Upon my second return, these posters were no longer there. People continue praying for the return of Father Ledoux, and hoping the new Archbishop of New Orleans, Archbishop Gregory M. Aymond, will bring Father Ledoux back home. “I wish our new Archbishop Aymond could bring Father Ledoux back to us because we miss him a lot,” said an anonymous parishioner. The struggle has lasted a year and is still going on. It might be the biggest African-American Catholic struggle in the nation to keep a church from closing its doors. Like the late activist priest, Father Jean-Juste, in Saint Claire’s Parish in Ti Plas Kazo, Father Ledoux remains a legend at Saint Augustine’s Parish in Tremé. The involvement of both priests, Father Jean-Juste and Father Ledoux in their communities did not only make them the pastors of their parishes, Saint Claire and Saint Augustine, but also fathers for people in their communities, Ti Plas Kazo and Treme. I have written this article in memory of the people’s struggle at Saint Augustine Church in Tremé to keep their church alive. I also remember the struggle of my people at Saint Claire’s Parish in Haiti, Ti Plas Kazo on Delmas 33, to bring back the late activist priest and defender of human rights, Father Gerard Jean-Juste, priest of Saint Claire Church from 2004 to 2009. He was arrested twice by the Haitian de facto government for his political opinions from 2004 to 2006. Father Jean-Juste died in May 25, 2009 at Jackson Memorial Hospital in Miami, Florida. After Father Jean Juste’s passing, a new priest, Father Hilaire, was assigned to Saint Claire parish. I also want to thank my friend, Alison McCrary who drove me back and forth to Saint Augustine Church and talked to me about her five-year experience there. She referred me to some sources, which helped me so much with this article. Campbell-Rock, CC. “Protesters Still Occupying Historic New Orleans Church Rectory.” A Katrina Reader: Readings By and For Anti-Racist Educators and Organizers. Changing White Supremacy Workshop, 29 Mar. 2006. Web. 12 Sept. 2009. “Saint Augustine Church.” African American Registry. 2005, 2006. Web. 16 Sept. 2009. Shake the Devil Off. Dir. Peter Entell. Show And Tell Films, 2007. DVD. “Tremé.” Living Culture Project: Tulane/Xavier Center for Bioenvironmental Research. 2008. Web. 15 Sept. 2009. Good piece! Thank you Wadner!